Aion’s plans have reached fulfillment, and the thin blue line of the Magdalene Order is powerless to stop him. Will the ultimate plan of the Master of the Sinners reach fruition? All that remains to complete the overthrow of Heaven itself it is one final act of betrayal… a betrayal carried out by a Devil in a blue dress! The future of all Creation hangs in the balance in the final apocalyptic volume of Chrono Crusade! 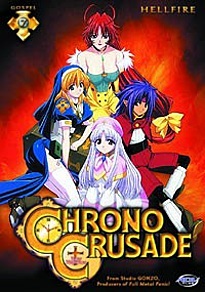 Chrono Crusade: Hellfire (SRP $29.98 DVD) is a DVD-only release including episodes 22-24 presented in both English 5.1 and Japanese 2.0 with English subtitles. Extras include “Azmaria's Extra Classes,” “Chrono Crusade Chronicle,” production sketches, and unused on-air openings for episodes 22, 23 and 24, clean opening animation, clean closing animation, and previews of upcoming ADV Films releases.